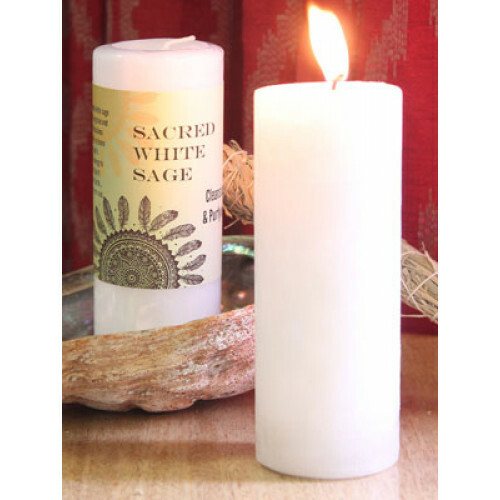 A natural white candle, with a blend of three sacred sage oils. 2.5 x 6.5 pillar burns for 80 hours. 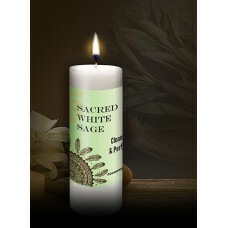 The Sacred White Sage candle can be used in place of sage smudge sticks. Use to spiritually cleansing any room, person or magical working. Sage clears the energy that had been limiting your growth and to the connection of the unlimited abundance of the universe. Blessing: I use this sacred white sage to cleanse from me all the negativity and dissonant vibrations from my body, my home and my spirit. I send this energy to the great spirit and mother earth, never to be returned.